Many of the gardens we saw at Buffa10 had a similar focus to what you see above - loads of flowers and frequently an emphasis on fragrant ones. I loved those experiences and how happy I felt in those gardens. But there was one garden on our Sunday tour of Lancaster Avenue that was a bit different from the others. It starts out similar to the others. The scene above is from the front yard. From the same front yard, the colors of the plantings echo the colors of the porch. The main garden is actually a small yard on the side of the house (the house was on a corner). 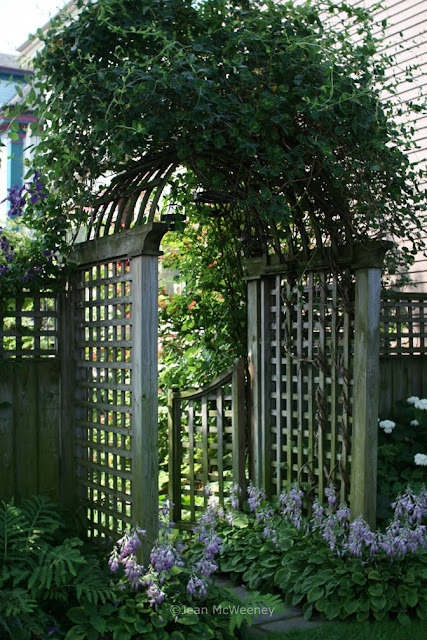 I loved the gate and arbor and all the plantings around it. Standing in front of the gate you glimpse the the formality to come. 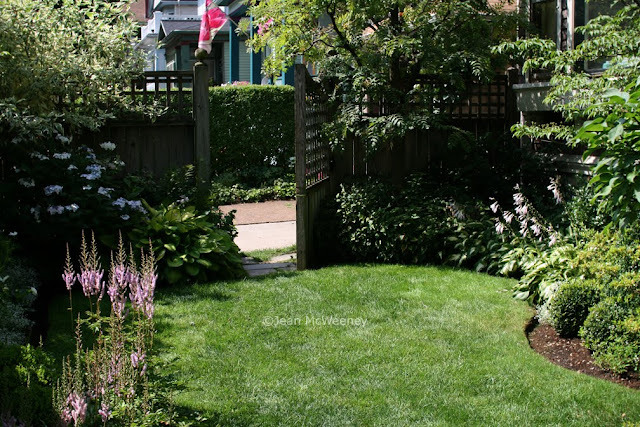 The side garden is formal and in pastel shades with an undertone of green. It felt very serene and calm. I like the back gate, large enough for larger gardening equipment perhaps? 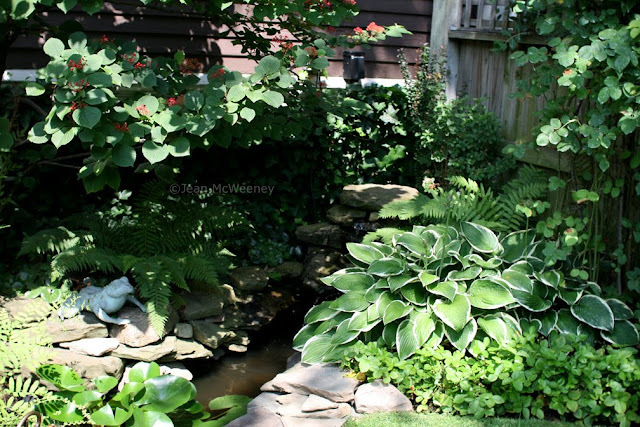 Somehow, in that little space, there was room for a small pond and waterfall. Again, very soothing. The pond is tucked up towards the front gate on the left, and it surprises you if you come at it from this direction. I hope you agree how lovely this tiny little yard is. It may not appeal to everyone, but I think the fact that it was different enough from many of the other gardens put it up at the top of my list for favorites. You can see many more posts from Buffa10 here. Oh, I like this garden. I was sorry to have to leave on Sunday and miss these gardens. Thanks for sharing them online with us! I like this garden too. But it could use a large blue trash can in it for color. Jean, I loved the serenity of that side yard. It was a much more meditative space and very nicely done. I love the garden, I wish that I could have been there with you guys. The Monarda display is magnificent, and the trimmed Buxus add a perfectly appropriate focal point! Thanks for showing what we missed by leaving early on Sunday Jean. I like the formality here, and that gate is fabulous! Staying longer was trumped by arriving home relatively perky rather than exhausted to the point of illness, like happened after Chicago. Wonder if I made the right call? Beautiful garden! I have so enjoyed seeing all the photos of the Buffalo gardens. Do they do this every year? Oh...I like this one. 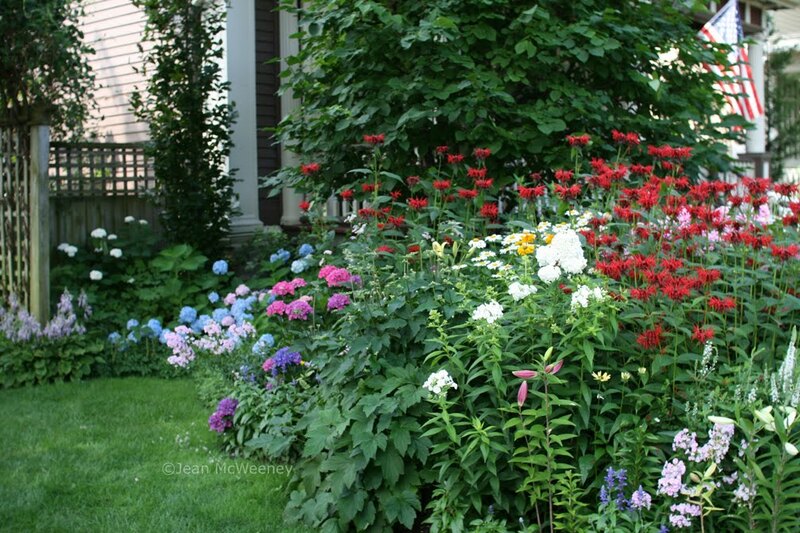 It has a tidiness, that some of the cottage gardens just don't have. I'm glad you got to see this, so you could share it with us. This one caught my eye too. I'm posting about the Lancaster Ave gardens right now. Phillip and those who missed the meet-up: this is the 3rd year in a row that it's been held, each time in a different city. Next year it'll be in Seattle (I hope I can go) and there's a rumor that the year after that it might be in Charleston, SC. I highly recommend trying to make the next one! 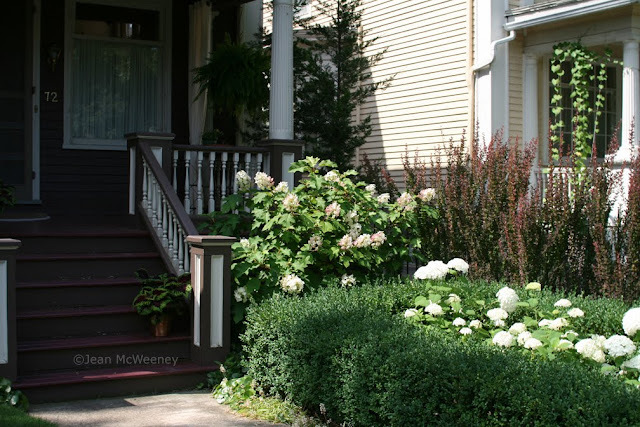 Also, Buffalo, NY, does "Garden Walk Buffalo" every last weekend in July and it has 350 private gardens on tour; we saw quite a few of the gardens that are on the walk but nowhere near 350. Amazing! Pam - your photos of this garden are SO much better than mine that it looks even more inviting! Wow, I'm in awe of the lawn edges--clean, neat, tidy! I need me some of those, and badly! I missed this one. It reminds me somehow of Alice in Wonderland. Hello Jean, I've been wondering about Buffalo. 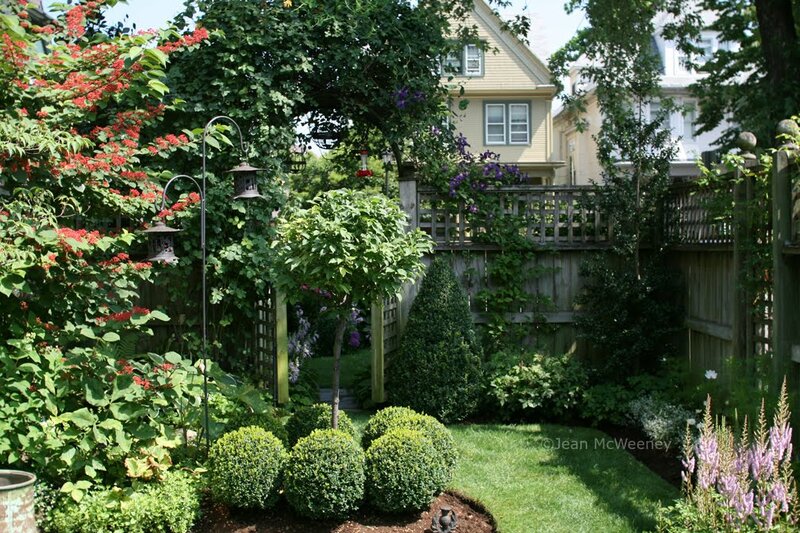 Thank you for the tour of this Lancaster Avenue Garden...the garden with two different personalities. Luv that there's a hummingbird feeder hanging from the arbor, but it looks empty. It must have lots of visitors. I see that you have other Buffalo posts for me to check out. Thanks for coming by my blog last week. I've not forgotten that you were one of my first vistors back in February '09. I liked the contrast between the riotous bed outside this little enclosed garden, and the serenity within. It was also amazing how much variety there was while still retaining that serenity. This is so lovely, Jean! 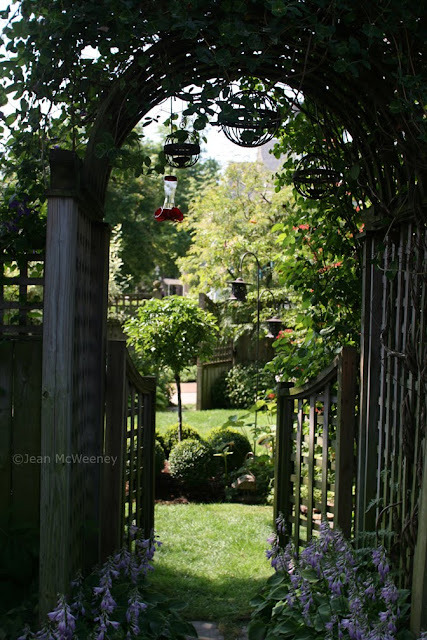 This is how I would love my garden to look--such a peaceful and inviting place. These Buffalo gardeners certainly made great use of every square inch. That is a beautiful yard. The back is wonderful, but I love the front.